IT'S LIT! 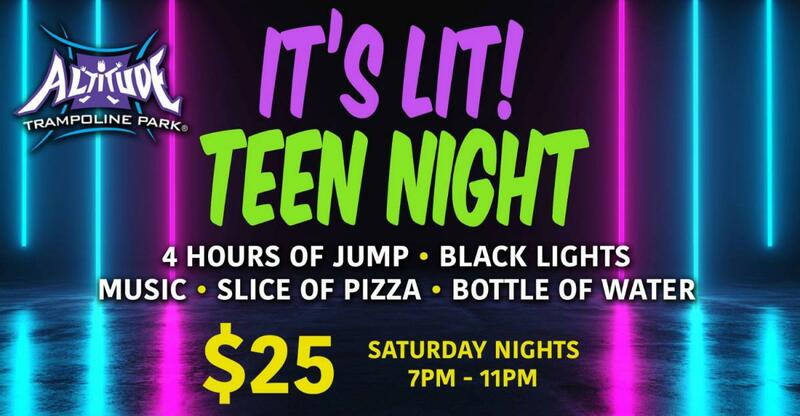 Teen Night! Saturday Nights, 7-11pm, $25. Ticket price includes four hours of jump, 1 slice of pizza and 1 bottle of water Altitude Safety Socks ($3) required but not included. No re-entry or outside food & drinks permitted. Altitude Safety Socks ($3) required but not included. No re-entry or outside food & drinks permitted.